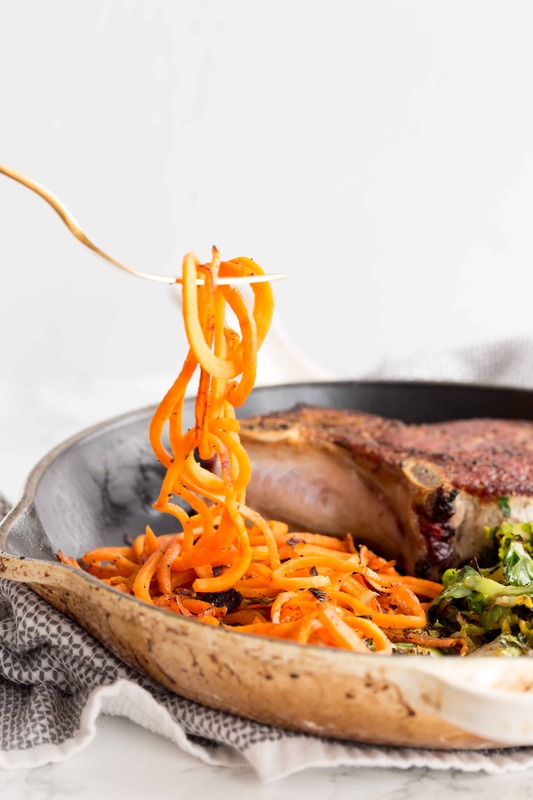 These easy, juicy pork chops are perfect for those busy weeknights when you want a nutritious and high protein meal with vegetables, but don’t have the time. With spiralized sweet potatoes and brussels sprouts, this is a filling and gluten-free meal. The secret to these juicy, crispy pork chops? To get perfectly crispy pork chops, you need a great searing process. Typically, you’re supposed to let meat sit and not move it, but I love this method because of the crispy crust. My other tip for a crispy, tasty, and salty pork chop crust is to generously season with salt and pepper before cooking. It takes more time at the stove, but as your pork chop turns golden brown, you’ll be a happy and proud chef. What I love about these pork chops is that their delicious juices and fat release in the oil they’re cooked in and create the mixture that the brussels sprouts are cooked in, infusing those flavors into the sprouts. The sprouts char from the hot pork chop juice and are simply seasoned with salt and pepper. This is a simple, easy, and quick gluten free meal that will make your weeknight rotation. Season one side of the pork chops generously with salt and pepper. Heat the coconut oil in a cast iron skillet over high heat. Once oil is shimmering, add the pork chops, seasoned side down. Season generously with salt and pepper and let sear on high heat for 3 minutes, flip, and sear another 3 full minutes. Flip again and let cook for 5 minutes and flip again. Repeat 3 more times (5 minutes per side) or until pork chop register 160 degrees on the fattiest part. Remove the chops and set aside on a plate to rest. Immediately add in the brussels sprouts, season with half of the garlic powder, red pepper flakes, salt, and pepper. Cook, stirring often, until sprouts are bright green and fork tender. ?While the pork chops cook, heat the olive oil in a large skillet over medium-high heat. Once oil is shimmering, add the sweet potato noodles and season with the remaining garlic powder, salt and pepper. Toss until al dente, about 7 minutes. Remove from heat and set aside, covering to keep warm. 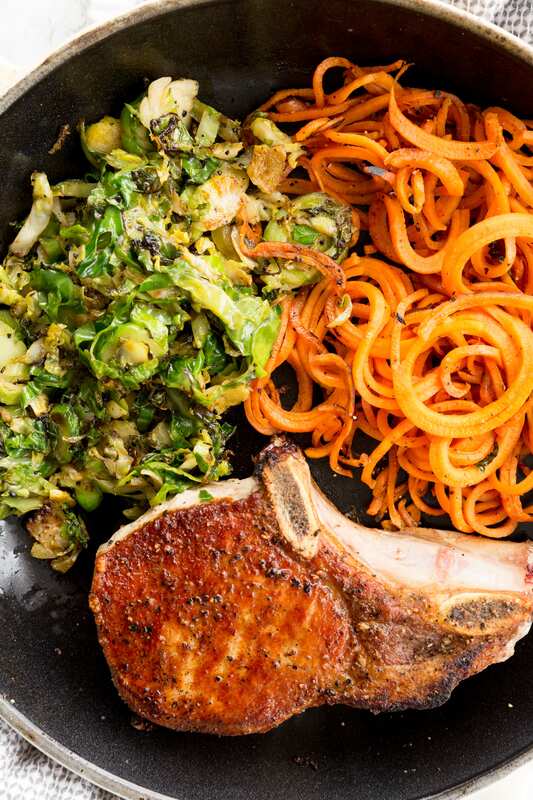 ?Once everything is cooked (sweet potato noodles, pork chops, brussels sprouts), divide into two bowls and serve. This looks like a perfectly balanced and delicious meal! 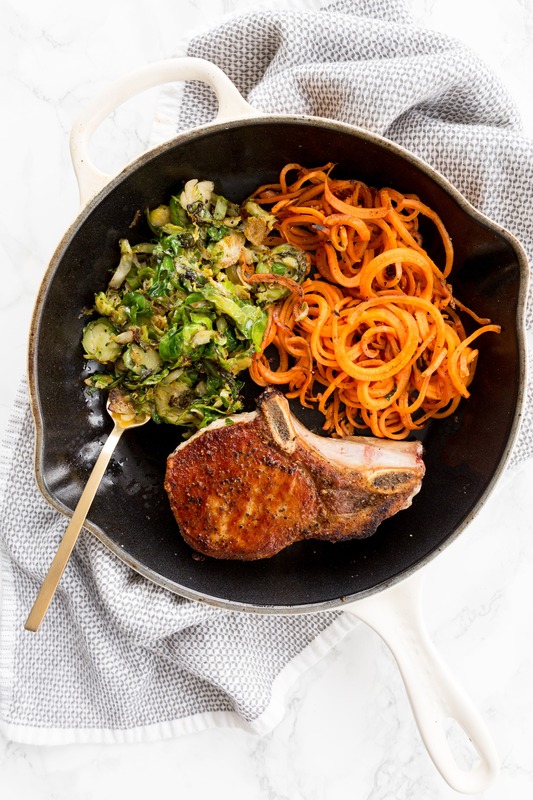 And though I know it's all about the spiralized sweet potato, I am ALL about that pork chop. Ha! That crust, though! *droooool* I'm definitely going to use your / The Kitchn's cooking method next time I make chops. It's a total winner! You must give it a try. Just made this menu tonight and it was delicious! Probably only cooked the pork chops a total of 25-30 minutes before they were cooked through at at 160 degrees. It doesn't how much olive oil to use for the sweet potato noodles in the ingredients list, but I used about a tablespoon and they were so good!! Delicious meal, if a little messy on the stove. Thank you for your notes! We're so happy you liked it.